Oleksandr Voznyuk’s area of expertise encompasses a wide variety of competition law issues, including merger control, concerted practice, abuse of dominance, restrictive and discriminatory practices, unfair competition, procedural aspects of AMC’s activity, as well as public procurement issues. 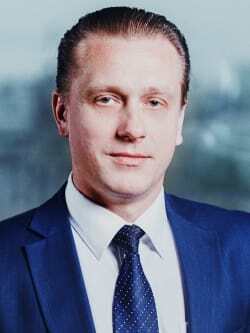 Oleksandr joined Asters after 16 years at the Antimonopoly Committee of Ukraine (AMC), including serving as the AMC commissioner for seven years. In the earlier years of his career, Mr Voznyuk occupied various positions within the AMC Legal and Legal Enforcement departments, including AMC Chief Legal’s office. Mr Voznyuk’s is well-known for shaping AMC competition policy, modern competition law and enforcement practices. In particular, Oleksandr is a co-author of "The comments to the Law on the Protection of Economic Competition" and of "The guidance on control of concentration of legal entities based on the comparative analysis with the EU competition rules", as well as of a series of publications and scientist research on competition law issues: eg, harmonisation of the Ukrainian competition law with the EU competition rules, methods of cartel investigations, retail market researches and analyses of enforcement practices, etc. He also worked as Ukraine’s member of the state procurements and cartels working groups of the CIS Interstate Council for Competition Policy. Mr Voznyuk has advised large international and Ukrainian clients such as ACNielsen, Bunge, HIPP, Kronospan, Lantmannen Axa, L'Oreal, Metro Cash & Carry, Philip Morris, Sanofi, Siemens, State Saving Bank. Mr Voznyuk has acted for a client in the cartel case which attracted the highest fines in the history of the AMC, and succeeded in convincing the court to reverse AMC's fining decision and compel the AMC to impose a considerably smaller fine.